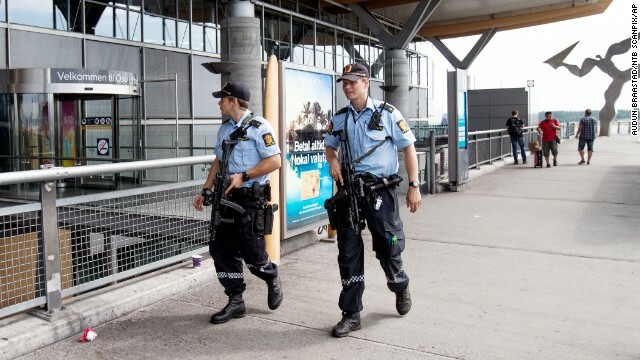 Armed police patrol outside the terminal at Oslo Airport on Thursday, July 24. (CNN) -- Norwegian officials say they think Islamist terrorists could strike the country within a few days, but they do not know what the plot is. The Police Security Service "recently received information that individuals affiliated with an extreme Islamist group in Syria may have the intention of carrying out a terrorist action in Norway," the service said in a statement Thursday. A preliminary investigation strengthened the credibility of the information, the statement said. "We also have information indicating that a terrorist action against Norway is planned to be carried out shortly -- probably in a few days. "We have no information about who is behind such an attack, how it will be carried out, the target or in what way such an attack will be carried out. ... As the information is not specific and not very concrete but at the same time credible, it is difficult to give advice to the citizens of this country on how to act in this situation." Security has been increased at airports, train stations, ports and major intersections, according to The Nordic Page, a Norwegian English-language news site. Norway has long been threatened by Muslim extremists. Al Qaeda leader Ayman Zawahiri mentioned Norway in a recording released back in 2003 -- when he was Osama bin Laden's top deputy, -- that urged Muslims to take a lesson from the 9/11 hijackers and "light a fire under the feet" of the United States, Britain, Australia and Norway by attacking embassies and corporations. At the time, Norwegian media speculated that al-Zawahiri may have confused Norway with neighboring Denmark. But while Norway did not support the war in Iraq, it did send special forces and fighter planes to Afghanistan as part of the U.S.-led war. In 2004, Norwegian officials arrested the former leader of an Iraqi Islamic militant group. In 2006, Norwegian embassies were among the targets of violent protests after newspapers in several countries including Norway published depictions of Islam's Prophet Mohammed. In 2011, Norway suffered a terrorist attack carried out by Anders Behring Breivik, a right-wing extremist with a hatred of Muslims. Eight people died in a bombing in Oslo, and 69 young people on nearby Utoya island were gunned down. The following year, the Muslim extremist group Ansar al-Sunna threatened Norway with a 9/11-style attack unless part of the capital, Oslo, was turned into a Muslim nation, the International Business Times reported. "We do not wish to live together with dirty beasts like you," the group wrote in a letter to Norwegian lawmakers and newspaper editors, according to the report. In its statement Thursday, Norway's Police Security Service said "Extreme Islamism is still the most serious terror threat against Norway. Also, we state that it has for a long time been a strategy to recruit extreme Islamists in war and conflict zones to carry out terrorist actions in Europe, and that Syria at the time being is considered to be the one of the leading arenas for this recruitment." The threat from Islamist extremists is increasing, police said.